Culinary travel is hot but travelers don’t often associate farm-to-table cooking with beach destinations. Located on a peninsula at the tip of Baja California, Los Cabos is cradled by the aquamarine waters of the Pacific Ocean and the Sea of Cortez on its coasts. For several decades, the area has attracted a mix of snowbirds, celebrities, timeshare owners, and others because of its promise of almost perfect weather. The sun shines brightly more than 300 days a year (some claim as many as 360) with only minimal rainfall (less than 10 inches per year) mostly during the summer. Although a desert climate with sandy soil might seem to be inhospitable to organic farming, this hasn’t been the case. Pioneers like Enrique Silva, the chef and owner of Huerta Los Tamarindos, have brought expertise, commitment and grit to the practice of sustainable farming in Los Cabos, making the area one where the promise of fresh, locally produced fruits and vegetables is as inviting as the weather. After visiting friends who owned a beach house in Los Cabos, like many other tourists, Chef Silva was smitten by the beauty of Baja. Trained as an agricultural engineer, he decided to leave his home in the Mexican state of Sonora in search of new opportunities. At that time, almost 25 years ago, the population of Los Cabos was about 3000 people; now, it has mushroomed to some 240,000 and entertains nearly one million guests each year. When he arrived, Silva spent some time as a beef distributor and then moved into the hospitality industry, working at the legendary Hotel Palmilla (now One & Only Palmilla Resort), where he was mentored by Chef Larry Nicola. Eight years later, Chef Silva finally realized his passion when he and a partner, Fernando Hernandez, opened Tequila restaurant in downtown San Jose del Cabo (one of the two towns in Los Cabos). Other restaurants have come and gone over the years but Tequila has weathered downturns in the economy, serving dinner every night for 17 years. The restaurant’s longevity can be explained not only by its innovative menu, tastefully prepared dishes, and Zen-like garden setting but also by Silva’s insistence on serving fresh, local farm-to-table fare before it became trendy. For some time, Chef Silva had his eyes on a property about ten minutes from his restaurant. His dream was to eventually grow his own fruits, vegetables and herbs. When a 17-acre farm once used to cultivate sugar cane became available for sale, he purchased the property in 2003, along with an existing brick structure built in 1888 that would provide the perfect setting for a restaurant. He also created a cooking school, naming the property Huerta Los Tarmarindos (huerta is the Spanish term for a fertile area, such as a farm) and recultivated the once fallow land to meet the arduous organic certification standards set by the U.S. Department of Agriculture. Although Baja has a relatively short growing season, extending from November through May, the crop includes mangos, bananas, poblano peppers, passion fruit, tomatoes, greens, eggplants, tamarinds, pineapple, guava, avocados, and various herbs. Organic farming can be challenging for any small farmer, often requiring crop rotation and the use of natural insect repellants such as garlic, soap and pepper. Last year a record rainfall, the worst in 40 years, reduced the size of the crop but didn’t dampen Silva’s spirits. Overcoming natural and bureaucratic barriers, Los Tamarindos now supplies much of the produce served at his two restaurants and is also available to locals at the local organic farmer’s market held on Saturday mornings (further down the same dirt road as the farm) as well as to chefs at other upscale restaurants and hotels. At Huerta Los Tamarindos, visitors can dine at the patio restaurant from noon to 10PM. A new menu is scrawled in chalk on a blackboard outside the kitchen each day highlighting the seasonal vegetables and fruits that have become ripe for picking. On breezy nights, guests dine under heat lamps on tables that are beautifully set with colorful Mexican pottery. The menu emphasizes sustainable seafood, purchased from local fishermen. The dishes reflect the Chef’s Baja-style cooking that uses traditional Mexican spices, recipes, and cooking techniques in a nouvelle international style. The former beef distributor also has a special knack (and, perhaps, the right connections) for finding the best meats and poultry. Savvy guests carve out the good part of a day to spend at the farm not only to eat, but also to learn about organic farming. Every day except Tuesdays, Silva runs roll-up-your-sleeves cooking classes where small groups of visitors create their own meals and learn about food production in Baja and beyond. After a tour of the fields under cultivation, lasting about one hour, guests wash up and don aprons for an educational and entertaining 3-hour cooking class with the Chef. Aspiring cooks and farmers ask questions and laugh together. When the meal is ready to be served and the students finally sit down at a long wooden table to eat the delicious bounty from the farm, there is a feeling of accomplishment and appreciation. 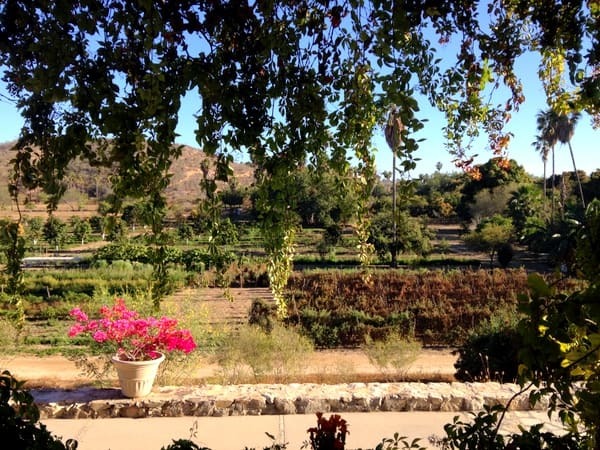 Both the flavors of the food and sense of camaraderie are enhanced by Silva’s careful selections of wines from the Guadalupe Valley (located in the north of Baja). Whether you are there for a meal or a class, you can’t help but leave feeling more respectful of the love that goes into farm-to-table cooking. To find out about cooking classes or to make a reservation, call 624-105-6031 (in Mexico) or go to Huerta Los Tamarindos online. At the farm, don’t forget to stop at La Tiendita de Lulu (the little store). The charming Lulu tastefully curates a changing display of clothes, jewelry and art (available for sale) that she collects from all over Mexico. Previously published on the NBC Universal Website, Life Goes Strong, this article won a 2013 Gold Award for excellence in travel writing from the North American Travel Journalists Association (NATJA). Thanks so much, Donna! It was very exciting to win the award for this story—especially since I just came back from a return visit! Great story! We’ll make sure to visit Huerto Las Tamarindos for lunch or dinner on our next visit to Cabo. We’ve enjoyed a farm tour and long late lunch (with wild hibiscus margaritas) at Flora Farm in Los Cabos, which is another farm-to-table farm and restaurant (Cindy Crawfood and George Clooney have been seen eating there :-). We’ve been to Flora Farm too—I’m hoping we’ll get to one farm or the other together! Congrats on the award, Irene! A most interesting story. We return here every year because the food is so special. I can still taste the tomatoes straight from the garden. Love your sentiment and agree with it completely! Congratulations on the award. It’s a great story. It sounds like a restaurant worth a visit. I’d love to take the cooking class. Thanks so much, Donna! Hope you do because it was so much fun! Congrats on your award, Irene. We always love to learn about farm to table dining. We try to eat like that as much as possible. Luckily Santa Fe has a lot of chefs who are interested in this movement. Santa Fe is a great food city! Congrats, Irene! As usual, your stunning photography drew me in to read more about the subject. Very nice profile on Chef Silva. Thanks for stopping by again, Patti! Cabo is one of our favorite places, although we haven’t spent too much time in town as we usually head out near El Cardinal where we have friends, but Cabo is lovely as are the people. Haven’t visited that area on the Pacific because we usually stay near the Sea of Cortez! I totally agree that the people make the place special! You’re right – I wouldn’t have immediately thought of Los Cabos and farm-to-table cooking. Loved learning about Chef Silva’s story, restaurant and classroom. You look like a natural slicing those tomatoes, Irene. Fortunately, you can’t see how many were eaten and how many went into the recipe, Cathy! What an enjoyable article! And your photos really tell the story too! What a wonderful way to spend a day – sounds perfect to me being educated on organic gardening techniques and then being taught by the maestro with fresher than fresh ingredients and to then sit back and enjoy those flavours – my mouth is watering!